The Royal Canadian Mint on Monday unveiled a series of commemorative coins that pay tribute to the 100th anniversary of the sinking of the RMS Titanic. In 1912, the luxurious Titanic was known as the unsinkable ship. An unfortunate collision with an iceberg, however, proved otherwise. Sailing on her maiden voyage from Southampton, England to New York, USA, she sank on April 15, 1912 in the North Atlantic off the coast of Newfoundland. Tragically, 1,517 of the 2,223 passengers died. Marking the historic event, the Royal Canadian Mint has released three commemorative coins — a $10 silver coin, a colorized 50-cent silver plated coin and a colorized 25-cent cupro-nickel coin. "The Royal Canadian Mint is proud to commemorate Canada’s history, culture and values with special collector coins. Canada is forever linked with the story of the RMS Titanic through the efforts of Canadian ships that took part in recovery operations and by the memory of the lives lost that rest peacefully in Halifax cemeteries," said Ian E. Bennett, President and CEO of the Royal Canadian Mint, who revealed the coins at the Maritime Museum of the Atlantic in Halifax. At a price of $64.95 and minted in proof quality to 99.99% purity, the $10 silver collector coin depicts the bow and port side of the Titanic, traveling on its maiden voyage with North Atlantic waters shimmering in its wake. The iceberg that sealed Titanic’s fate is shown in the foreground with a map of the Canadian Atlantic coast depicted above. The scene was designed by artist Yves Bérubé. Inscriptions on the silver coin include CANADA, 10 DOLLARS, 2012, RMS TITANIC and the nautical coordinates at which Titanic sank (41°44, 49°57). This coin’s mintage is limited to 20,000. Also designed by Yves Bérubé but listed for $34.95, the proof 50-cent silver-plated and colorized coin depicts a different view of the ship with the North Atlantic waters glistening in colors of blue. Inscriptions include CANADA, 50 CENTS, 2012, and RMS TITANIC. Mintages of the silver-plated coin are capped at a lower limit of 15,000. Designed by Three Degrees Creative Group and available for $25.95, the specimen 25-cent colored coin shows two scenes of the historic ship, each with varying colors. 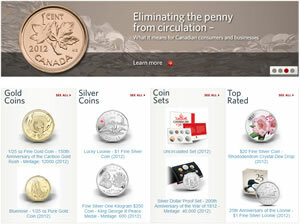 Inscriptions are fewer on the 25-cent piece with CANADA, 25 CENTS, and 1912-2012. The Royal Canadian Mint has not set an official mintage limit for the coin, only saying it will be available "While Supplies Last." Each coin bears the traditional obverse design featuring Susanna Blunt’s effigy of Queen Elizabeth II. 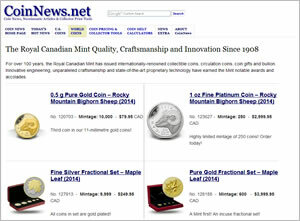 These commemorative coins are available directly from the Royal Canadian Mint’s website at www.mint.ca. Wow! A beautiful set of coins! I think this is the nicest Canadian commemorative set I have ever seen. Andy, at 15.87 grams and composed of 99.99% silver, the $10 coin has a smidgen over one-half ounces of troy silver. Well, a month ago I ordered a Canadian Mint War of 1812 Silver Proof commem, and when I got it, I was very disappointed. Compared to the US MINT products, this CA MINT coin seemed to have a low relief, very “flat” and lifeless detail, no contrast between the figures and the background and a luster that just looks cheap, as if it’s made of std nickel material. I said “Blah”, and sent it back. This Titanic coin might be better, but I’m not buying one. Just my opinion.